MITSUBISHI STILL IN THE GAME by Jim Corbran, Automotive Columnist Back in the 1970s Mitsubishi was a big player in the American motoring scene. It was partnered with the Chrysler Corporation, and in addition to selling its own cars on these shores supplied Dodge and Plymouth dealers with versions of its compact cars which the Pentastar company sold as Plymouth Arrows & Sapporos, Dodge Challengers & Colts, as well as by other monikers over the years. Eventually the Chrysler/Mitsubishi marriage ended, but the Japanese manufacturer retained its North American dealer network. They haven’t sold a lot of cars here lately, but they also haven’t given up. A fully-transferable 5-year/60,000 mile new vehicle warranty along with a 10-year/100,000 mile powertrain warranty certainly doesn’t hurt. Mitsu’s recently departed Lancer Evo has kept the corporate name alive in the very competitive hot compact category. And its Outlander Sport compact SUV is a very attractive vehicle. 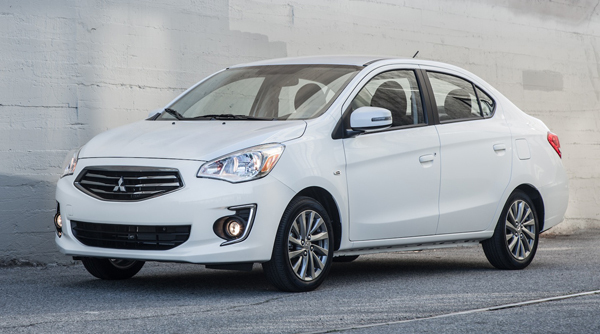 Mitsubishi has just announced the 2017 Mirage G4 SE sedan, a subcompact which they claim will be at the top of its class in combined fuel efficiency and CO2 emissions. Powered by a 1.2L three-cylinder engine, the new Mirage will feature available smartphone integrations and support for Apple Carplay™ and Android Auto™. More info? Visit Mitsubishi Motor’s Mirage G4 web page here. ### The post MITSUBISHI STILL IN THE GAME appeared first on Buffalo Cars.